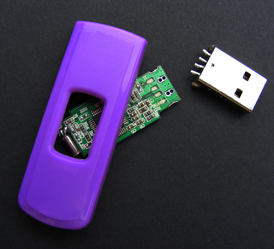 Have a broken, bent, unrecognized or otherwise non-functional flash drive and need to get your files back fast? FlashDrivePros will recover your data in a flash! No matter what happened to your flash drive, our expert data recovery engineers are almost always able to rescue the lost files from any type of flash memory device including USB flash drives, Thumb drives, camera memory cards and SSD hard drives. Whether your flash drive is malfunctioning, not recognized or has been physically damaged, we can repair it and get all your files back fast for a low, fixed price. Specializing in flash memory allows us to offer lower prices, faster service and a higher success rate than other flash drive data recovery companies that work on all types of memory devices rather than focusing on one technology. Recovery is 100% guaranteed or no charge! To get started, click below or give us a call. Note: While we collect your payment information when you submit your order, we won't charge your credit card or PayPal account until after your files have been recovered. Read over a hundred more reviews on our Facebook Fan Page. A: Yes! We go to great lengths to ensure the security of our clients' files. If you choose to have your files made available for download, they will be encrypted before being placed on our secure server. You will be the only one with access to your files and data. A signed NDA is also available upon request. Q: How do I get my flash drive to you? A: You can mail or drop off your malfunctioning flash drive at any of our three data recovery centers worldwide. See order form for details. Please use a small box or padded envelope when mailing your flash drive. Tracking and insurance are also recommended. Q: What if my files cannot be recovered? A: Given our 94% success rate, there is a very good chance your files will be recovered. But if not, you will not be charged and we will return your flash drive at our expense. Q: How will I know when my files have been recovered? A: From when we receive your drive to the moment your files are recovered, we'll keep you posted on our progress by email or telephone. Just look for the email that says "Great News! Your Files Are Ready for Download!" in the Subject. Other questions? Call us Toll Free: 888-806-6567 or send us an email! 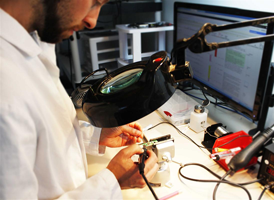 Need Data Recovery From Other Types of Devices? We can recover data from other types of devices too! This includes CDs, Smart Phones, HDDs, RAID arrays, and more. Give us a call or get a Data Recovery Quote online. Our prices are flat-rate and we only charge if we recover your files. Otherwise there is no fee and we will ship your device back for free. Note: While we collect credit card details up front, we only process payments after your files have been recovered. Physical damage including broken connectors, missing components, damaged circuit boards, failed previous recovery attempts, water damage, etc. Logical damage including corrupted file systems, erased or formatted drives, USB device not recognized error, drive displays 0MB, etc. NAND Flash chip data extraction is available when the circuit board is badly damaged or missing. No signs of physical damage? Try our custom flash drive data recovery software first!